Head to one of Europe's biggest Christmas Markets for bag loads of festive cheer and Christmas spirit. Christmas markets are a fantastic way to really get into the festive spirit. How could you not when the air is filled with the delightful smell of cinnamon and cloves, when the colourful lights are twinkling in the December air, when Christmas carols are sung by perfectly pitched choirs, and when everyone seems so full of joy at the season? Europe plays host to some pretty impressive Christmas markets, which include some of the biggest in the world. This is the place to be if you want to find some Christmas spirit (or anything else, come to that – everything you could possibly need is sold at a Christmas market!). Take Zurich’s massive indoor market, for example. The biggest indoor Christmas market in Europe, this fantastic feast for the eyes (and everything else) is located in the main train station, and with over 150 different stalls it fills the whole place to bursting. Lit beautifully and featuring a 50 foot Christmas tree decorated with 7,000 spectacular Swarovski crystals, you will be left speechless and very, very excited by everything going on around you. From roasted chestnuts to mulled wine, from gifts to clothing, enjoy your Christmas shopping in an entirely new way! Strasbourg Christmas market has been enticing the crowds and visitors since 1570. Buy your beautiful one off decorations, indulge in some pastries and hot beverages, and, as you stroll from pretty chalet to chalet, you’ll be mesmerised by the array of gifts on offer. 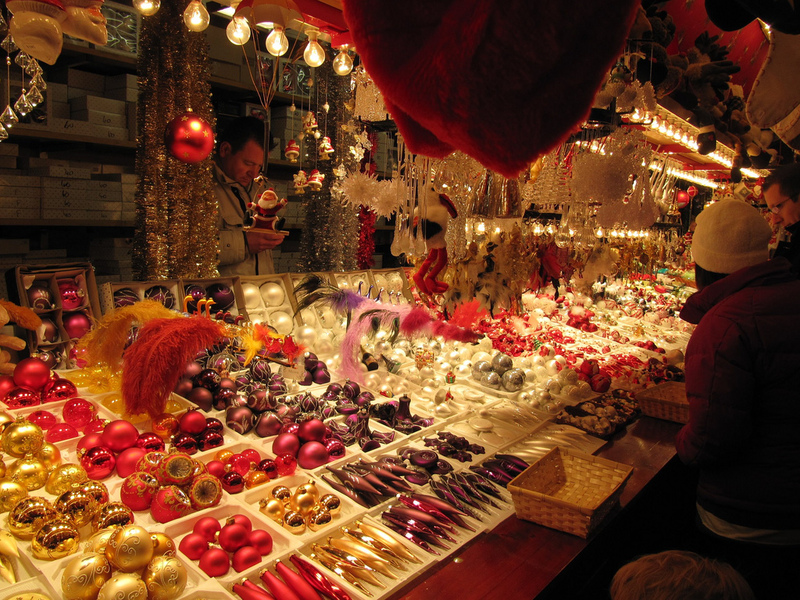 Even the hardest person to buy for will love something unique and special from this Christmas market. The market is located close to Strasbourg’s incredible cathedral, and on a chilly, crisp winter’s day there is nowhere more festive, and nowhere more stunning. La Defense, Paris hosts a huge (over 300 stalls, sometimes as many as 350) Christmas market each year. It is just by the Grand Arche, so the scenery is pretty spectacular, not to mention the sights, sounds, and smells of a traditional European Christmas market. The light show is really something to behold, and can be seen for quite some distance around, leading the way to the market itself. Vienna’s massive market is actually a few markets rolled into one, and combined they make up one huge and impressive place to do your Christmas shopping. This is a magical looking place to visit, and the Christmas spirit is everywhere you look when you start exploring the stalls, arts and crafts, food, and drink that is on offer. And to make it even more magical, the market in front of the City Hall has one floor dedicated to the children – toys and games galore! Cologne Cathedral is the location for the city’s biggest market, and it is a beacon for all who want to indulge in a little Christmas cheer whilst browsing the beautiful items on sale. Here you will see the largest Christmas tree in the Rhineland, as well as wreath makers, pewter pourers, glass-blowers, and all manner of other artisans at work. Plus you can sample freshly made gingerbread – deliciously festive! TRIED AND TESTED! I have sailed on a mini cruise in search of the famous Christmas markets in Cologne. You can read my Cologne Christmas Markets mini cruise review here. Book your next Christmas Markets mini break.